Alex Michael is an Award Winning Childrens Entertainer Oakham specialising in unique magical parties aimed at children aimed three year olds and upwards performing bespoke show to match the age range. (up to 16 years old). He has now such a good reputation he performs at well over 100 birthday parties and shows every year. 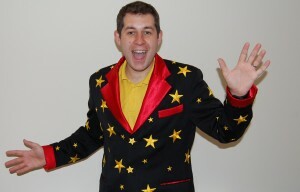 As a Childrens Entertainer Oakham Alex specialises in providing an exceptional level of service and great hassle free communication and offers a great value for money magic show and party packages. As well as his superbly funny, fully interactive magic show, his party package also includes a mini disco and games including parachute games, spinning plates, limbo and prizes and of course the most current pop music and lights. Please fill out the contact form on my website stating which party package you like the look of and I will send you full details. Alex aims to reply to all questions within 24hrs.